We never know when the final moment of our lives will be over. Sometimes very unusual things can happen, which changes everything. In the blink of an eye, it could all be over. 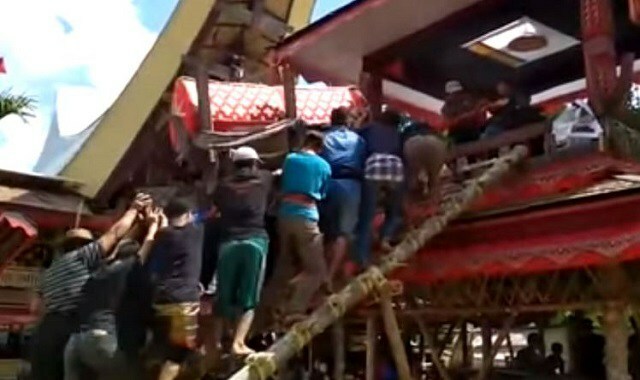 This is exactly what happened to a 40 year old man, who was helping to carry his mother’s coffin up a ladder in Sulawesi, Indonesia. His death seemed almost immediate, as the ladder broke. His mother’s coffin came crashing down upon him on Friday the 22nd. The impact was fatal, as seen in the video. Those surrounding him, couldn’t believe what had happened. The ceremony started out fine, until they started climbing up a wooden ladder. They did not take into consideration the amount of weight the ladder could hold. There were dozens of onlookers watching everything, as the elaborate ceremony took place. Pallbearers slowly seemed to make their way up this wooden ladder. It seems that it all started, after one pallbearer misstepped during a mere moment. After preparations…the pallbearers waited for a bit, before proceeding up towards the lakkian. This is a tower, where the deceased is placed. 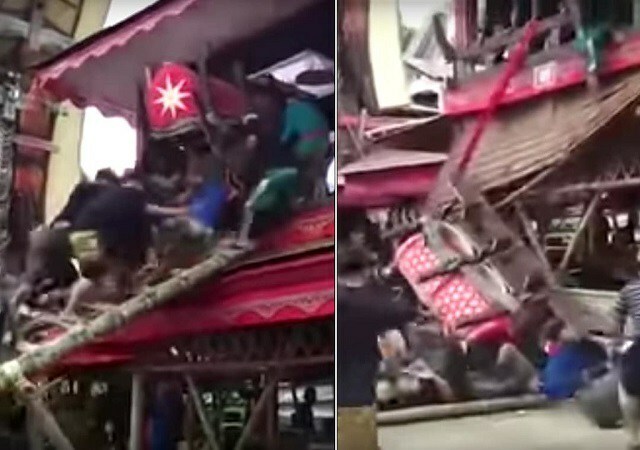 As seen in the video, they all came crashing down with the son Samen Kondorura taking full impact from the fall. Moments later, horrified onlookers screaming and rushing over to Kondorura’s aid. Kondorura’s injuries were unfortunately far too fatal. He later died at the hospital, not long after. Karma seemed to catch up with Kondorura. It is not known, why something such as this could ever happen like it did. From a supernatural perspective, was his mother so upset at the loss of her life, that she decided to take her son with him? Indeed all of this is quite strange. Perhaps it was nothing more than a accident, but a very unusual one. Certainly, a mother would protect her children at all costs. Khaleej Times, a local news site…mentioned that the ladder was not properly secured by local authorities. Apparently, Kondorura’s loved ones, have since decided not to sue officials at the scene. Kondorara’s body has been laid to rest beside his mother reportedly. According to Indonesian traditions, the casket is placed within a lakkian. This carved tower is used where funeral rites are later read during the ceremony. They are designed to be made higher up off the ground, out of the belief of ascension into the afterlife. These types of ceremonies can last upwards for days at a time. During this type of ceremonies, music, dance and the sacrifice of water buffalo is used.